Since shipping artwork internationally requires a high level of professionalism and experienced movers, it is definitely the most challenging kind of transportation services offered by shipping companies. There is actually nothing surprising about that as any mistake is fraught with large losses. Thereby, efficient transportation of fine art pieces overseas should be ensured by their safety at every stage of the shipping process, professional packing and loading, secure art storage, optimal delivery, and correct execution of customs documents. This is exactly what we offer you at Fine Art Shippers. However, it is still important to choose the optimal method of moving art, which includes the most suitable mode of transport. For example, for long-distance transportation, it is better to use air shipment, and for the transportation of heavy art objects, like large-size sculptures and statues, it is better to choose sea shipment. Let’s go through it all point by point. Collaborating with world’s leading airlines, Fine Art Shippers successfully ship precious artworks all over the world. High level of professionalism, well-coordinated logistics system, and an extensive partner network allow our company to provide a full range of fine art transportation services. A huge number of customers entrust us with shipping their treasured possessions by air, confirming our reputation as a reliable partner. Thus, this method of shipping artwork is the best choice for urgent and safe transportation throughout the world. Its key advantages are the surprisingly fast speed of delivery and documentary protection of fine art pieces. In addition, this service is characterized by excellent systematization, whereby the cargo arrives at its destination at a specified time without delay. At the same time, there are also some disadvantages, including a quite high cost. Besides, air shipment is not the best way to transport large art objects. Finally, it strongly depends on weather conditions. However, air transportation is undoubtedly the most popular method of delivery today as it makes life and work of our clients much easier. 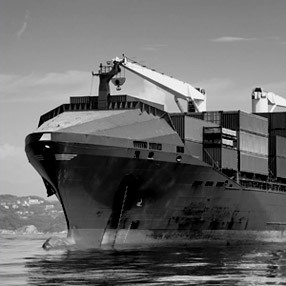 Sea shipment services provided by Fine Art Shippers are the optimal way for shipping large items to other continents. Many years of experience of our logistics specialists, partnership with the majority of shipping lines, and integrated approach guarantee a cost-effective transportation of any piece of art. In this way, the main advantages of sea shipment are the low probability of loss and damage, well-defined sailing schedule, and certainly its low cost. Nonetheless, like any other kind of transportation, it has its own disadvantages too. Among them are high dependence on weather conditions and limited navigation period, as well as low speed and frequency of shipments. In spite of this, it is still the best way to ship large sculptures and other oversized works of art. As you can see, there are pros and cons of both kinds of international transportation. However, at Fine Art Shippers, we are always ready to help you find the right solution. We will choose the best possible way depending on your particular situation. Our company takes the responsibility, guarantees security, and firmly commits to abide by the terms of delivery. You can trust us!